Summer is all about ice cream! Even if you're not making it yourself at home, you're thinking about it, buying it, going to your favorite ice cream parlor for some, and seeing plenty of reminders to eat more ice cream just about everywhere! It was National Ice Cream Day a few days ago and while I'm not sure how these national food "holidays" get conjured up and though I'm pretty sure none of us needs an excuse to eat more ice cream in the summer, I'm totally game for the fun of it all. For our part, I feel like we've been swimming in ice cream in the past month! I must buy more cream in the 3 summer months than I do the rest of the year combined. Each batch seems to disappear faster than the last, and I'm still buying and taking the kiddo out for ice cream on top of it. Honestly, I might need to give my ice cream maker a break and take a short ice cream-making hiatus. But before I do that, I made this batch of coffee chocolate chip ice cream. I had to try something new and this is what I picked. The coffee ice cream base is from David Lebovitz (so you know it's good). 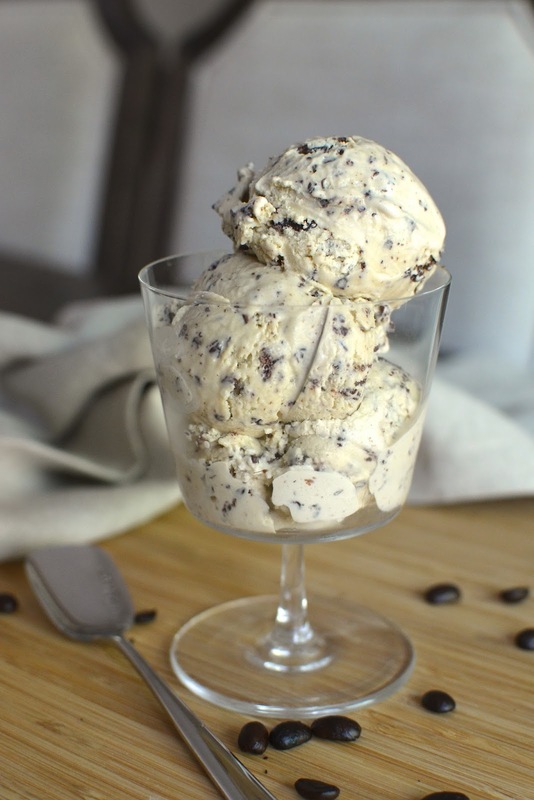 Unlike his Vietnamese coffee ice cream, which uses brewed coffee and condensed milk, this coffee ice cream gets its flavor from whole coffee beans, as milk and cream are steeped in it for about an hour. It yields a clear, strong coffee flavor that's bound to satisfy the coffee lover. And with an equal ratio of cream to milk, and a good 5 egg yolks in the custard, the texture is nice and creamy. Of course, I added chocolate chips because to me, coffee chocolate chip ice cream is better than plain coffee ice cream in most circumstances. If you feel the same, add 4 ounces of warm melted chocolate right at the last minute of churning like I did. Pour the chocolate in a thin steady stream into the ice cream at the last moment of churning and it will turn into little lacy wisps of chocolate flakes (though I sure don't mind when I end up with a few chunks here and there) running throughout the ice cream. Some people love their ice cream plain and smooth while I'm all for texture and extra add-ins, particularly when it involves chocolate and/or nuts! Whatever you prefer, hope you are cooling down with a sweet scoop every now and then this summer! 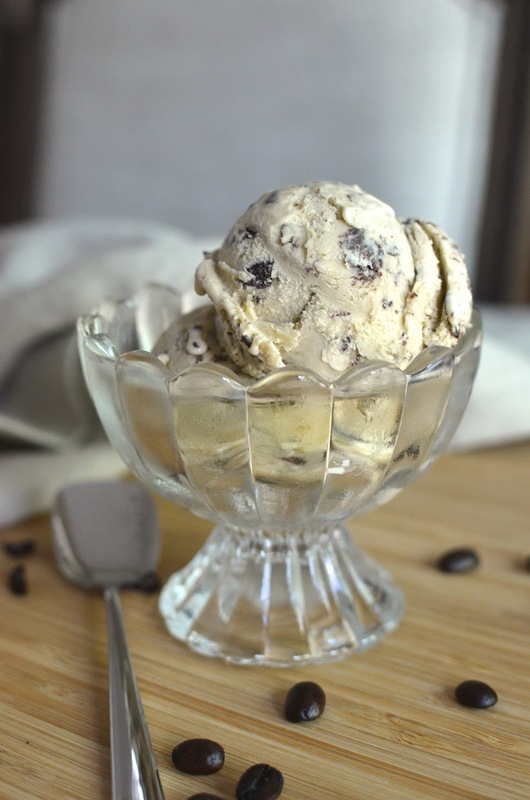 If you'd like to cool off with this homemade coffee chocolate chip ice cream, start with coffee beans. You'll need 1 1/2 cups of whole beans (that equates to a little under 4 oz. ); I used decaf. The beans go into a pan with the milk, 1/2 cup of cream, sugar and salt. Once warmed over the stove, cover the pan and let the mixture steep at room temperature for 1 hour. After the hour, rewarm the mixture and temper 5 egg yolks by slowly pouring and whisking this coffee mixture (including the coffee beans) into it. Then, scrape it all back into the pan and cook over medium heat, stirring constantly, until it thickens and coats the back of the spatula. To finish the custard, the mixture is strained into a bowl containing the remaining 1 cup of cream. Use your spatula to press down on the beans to extract as much of the coffee flavor from them as you can. Stir in a little vanilla extract and some finely ground coffee, and the custard base is ready to be chilled. Churn it as is for coffee ice cream, but for coffee chocolate chip ice cream, I melted 4 ounces of semisweet chocolate (you can use 4-5 ounces and either semisweet or bittersweet chocolate). I learned this technique of making "stracciatella", which here refers to ice cream/gelato with chocolate "flakes", from The Perfect Scoop. It is the Italian method of pouring warm, melted chocolate into cold ice cream so that it naturally breaks up into streaks or flakes into your ice cream or gelato. According to David Lebovitz, the trick is to pour the chocolate in a very thin stream (transfer it to a measuring cup for easier pouring) during the very last minute of churning. And also to try to pour it into the ice cream, not the dasher. 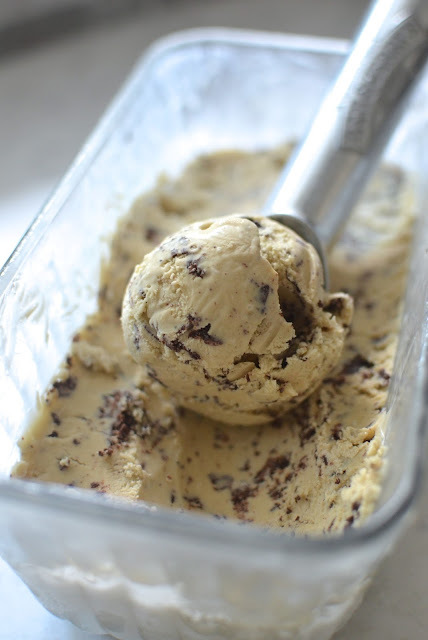 And there we have it...Coffee Chocolate Chip Ice Cream, made...and eaten (we are all out)! ...and where there's ice cream and hot fudge, there must be brownies (supporting evidence here)! I've made a few batches lately, though in fairness, I make these cocoa brownies all the time, no matter the season! Brownies + ice cream + hot fudge sauce = a happy, happy equation! Around here, we enjoy it a lot. Warm the milk, sugar, whole coffee beans, salt, and 1/2 cup of the cream in a medium saucepan. Once warm, cover the pan with a lid, remove from the heat and let steep at room temperature for 1 hour. Rewarm the coffee-infused milk mixture. Pour remaining 1 cup cream into a large bowl and set a mesh strainer on top. Set nearby. In a separate medium bowl, whisk the egg yolks together. Temper the yolks by slowly pouring the warm coffee mixture (with the coffee beans) into them, whisking constantly. Then scrape the mixture back into the saucepan and stir constantly over medium heat until it thickens and coats the spatula. Pour the custard through the strainer and stir in into the cream. Press the coffee beans into the strainer to extract as much of the coffee flavor as you can. Discard the beans. Stir in vanilla and finely ground coffee. Cool over an ice bath, then chill thoroughly in the refrigerator before churning. wow that last photo of brownie with chocolate ice cream looks totally irresistible! I've been making way too much ice cream lately! Seems summer is just an excuse to eat it. : ) Hope you are enjoying the summer so far! That cake is gorgeous! : ) I would love for you to publish the lemon curd biscuits. No need to ask at all. Thanks again! You enjoy the rest of the week, too. 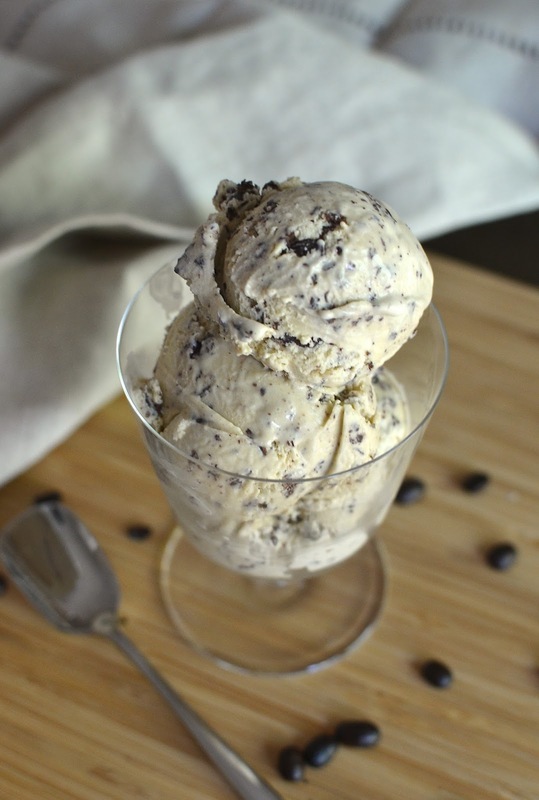 Coffee is my all-time favorite ice cream and homemade is the best! And especially David Lebovitz :) This looks so decadent and awesome! This has great sharp coffee flavor - perfect for the coffee lover like you. He is really awesome and that ice cream book is much loved by everyone! I hope he does another dessert book soon. Hope you guys are enjoying the summer. We are having brownies with ice cream on rotation. yikes! First I'm totally with you - coffee + chocolate is the best (and usually better than coffee alone for dessert!). And second, you are making me want to skip dinner and go straight to dessert with those brownie sundaes! Glad to hear it, Ashley! : ) I sometimes want to skip dinner and make a sundae the main event. It just goes down so fast and easy...too fast and easy! Oh my gosh! that looks so good! my mouth is watering! I LOVE that you’re into making ice creams, hot fudge and brownies. My birthday is coming up next month so I want a big bowl of this. Haha. How lovely does that ice cream look?! I bet it's amazing with warm brownies. Wow, I absolutely love the idea of coffee and chocolate chips...the bitter taste of coffee with the sweetness of the chocolate...what a nice treat! I can have ice cream any time of the year and chocolate vanilla is one of my favorite combos. And I also love ice cream and brownies pairing, I wish I could grab that bowl right away. Just can't wait to try this. Luckily, tomorrow is Saturday so that I can make it tomorrow. Yumminess overloaded. Hope there's a nice cool scoop or two of good ice cream in your weekend! Thanks! Coffee and chocolate is one of our favorite combos. Rich and decadent and essentially the best icecream "breakfast food". Think about it...dairy, coffee and eggs. That is breakfast, right?! haha - I love that! Totally logical to me! I'm glad we are thinking alike! I used to only want huge chunks of chocolate in my ice cream...but then I can to appreciate the thin flakes (especially since there are so much more of them and you get that delicate crunch...). Yum!